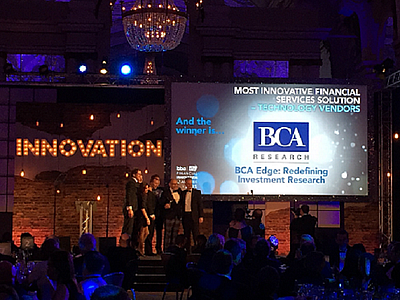 BCA Research (part of Euromoney PLC) has proven once again that they continue to lead the field in investment research by winning two innovation awards. The first one is the „Best Innovative Technology Solution for Small Firms“ at the 2015 HFM European Technology Awards. The second prize was earned a week later – the „Most Innovative Financial Services Solution“ at the 2015 bba/ifs Financial Innovation Awards. The award-winning product is called BCA Edge and is based on Ontotext‘s GraphBD semantic solution. BCA Edge enables investment professionals to identify and integrate actionable research content considerably faster of the time required by traditional research products. Ontotext is part of Sirma Group Holding JSC, recently successfully completed its IPO campaign on the Bulgarian Stock Exchange (BSE). Launched in early 2015, the solution visualizes, customizes and consumes research and charts to create actionable insights with features designed to seamlessly integrate into a professional investment workflow. Beyond search, the embeded Ontotext’s Semantic Publishing Platform empowers users to find related content and identify unexpected connections. That enables researchers to provide “knowledgeable” search results leveraging the ability to represent the complex relationships between markets, financial instruments, themes, views, trades, charts and reports.